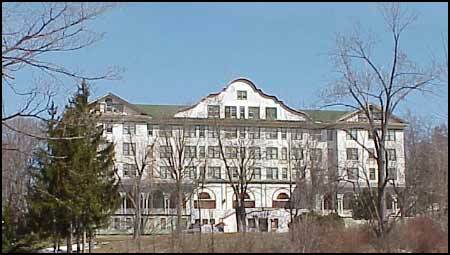 The Adler Hotel was the last large hotel built in Sharon Springs. It opened in 1929 and cost $250,000. The Adler Hotel has a capacity for 150 guests. It has a ballroom and its own mineral bath facility. Now this is a hunt for ghosts old and new. Entry into this forgotten wonder is no longer payed for with money. Another place in this unique town where you can feel the life force that used to flow so strong in the flesh and now flows in the trees and wood the wind blowing thru the halls and entry ways. 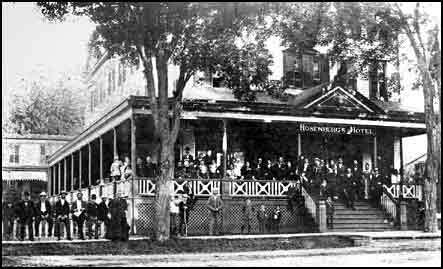 The 1850's Howland House, The 1896 Rosenberg Hotel and the 1870's Rosenberg House, were joined with connecting additions in 1900 to form the Roseboro hotel current 45,000 square foot building. The Roseboro hotel had 135 rooms, (but only 27 bathrooms!) one of the first sprinkler systems and a 1939 Otis Elevator. Go past this historic building today and you may see the open restaurant on the left side of the main floor. This is now the main use of this grand building. Rows of windows bring light through torn curtains into the long empty rooms. Rooms full of memories of over a hundred years of life in Sharon Springs. Mandeville Gallery Art, Science and History exibitions. New York Folklore Society's Gallery of Folk Art Afforable Folk Art. Niskayuna Train Station Restored 19th centery brick station. Picnic area, fishing, boat launch and bike path near by. Proctors - Main Stage Theatre - 440 Theater/ Iwerks - 440 Upstairs World-class singers, comedians, dance programs, opera, orchestras, musicals. Vale Cemetery Self guided walking tours of a rural cemetery. 907 State Street, Sch. Fly Creek Cider Mill & Orchard Hard ciders, apple wines, apple salsa, fudge, cave-aged cheese, pickled garlic and more. Northeast Classic Car Museum Exhibiting over 100 Classinc Automabiles. Staley Collection, Franklin Luxury Cars. Headless Horseman Hayrides & Hunted House. The Landis Arboretum 548 acre living museum. New York State's most complete collection of native plant life. Howe Caverns Underground caves, gift shop, gem mining, cafe, picnicking, hiking. The Cooperstown Blues Express Train rides with Live bands, Food, Bar. Content copyright . Turn Around Spa Lodge. All rights reserved.